A gummy smile (excessive gingival display in technical terms) refers to a smile that reveals too much gum tissue above the top set of teeth. Gingival refers to anything relating to the gums and this tissue lines your mouth and surrounds your teeth providing support. 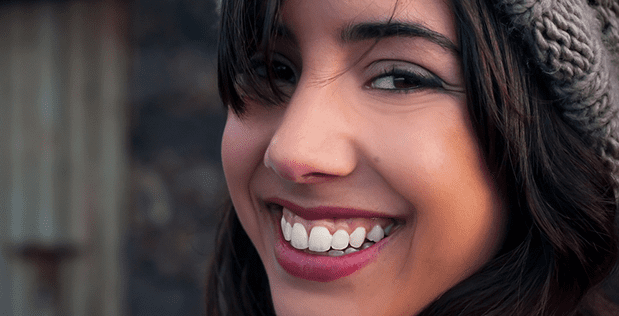 There is no set definition of a gummy smile and the diagnosis is highly subjective; some people consider their smile gummy even if just a little extra gum is visible. Gummy smiles are usually an aesthetic problem causing little to no issues with your ability to eat and speak properly. Uneven gum lines and excess gum tissue can however cause confidence problems since it affects the look of your smile, making you feel very self-conscious and less likely to smile. Most patients complain of a gummy smile based on aesthetics, however, there are cases where it is caused by an underlying dental issue. In these instances, proper dental care and treatment is needed to first solve the issue and then help reduce the gummy smile. A gummy smile can be caused by an abnormal tooth eruption, jaw development problem, improper bite, muscular issues, a hyperactive upper lip, etc. There are, however, various treatment options to help correct your gummy smile. If your gummy smile is mild and is caused by orthodontic issues such as a bad bite or minor jaw problems, then using orthodontic appliances can help. Orthodontics such as braces and Invisalign can help correct the jaw problems and bite issues which can help make your gums appear smaller when smiling. Some patients feel like their upper set of teeth appear too short which impacts the amount of gum tissue that is visible when smiling. This can be caused by wear and even genetics. Veneers or crowns are a simple dental restoration that can be used to make your teeth appear longer. This will help balance out your teeth and gums, making your smile less gummy. If your teeth haven’t fully erupted (making them look short), a surgery to lengthen the crown can be done. Gum tissue and/or bone is removed to expose more of the tooth allowing the gums to withdraw into its correct position. If you suffer from a short or hyperactive upper lip, more of your gum will be exposed when smiling. A lip repositioning surgery can help make your smile less gummy and is a good alternative to the more complicated jaw surgery. Using special dental lasers, your dentist can help remove the extra gum tissue, so you don’t have to undergo surgery to get the same results. Some patients experience an excess of gum tissue which can be the cause of their gummy smile. If this is the case, a gingivectomy can be performed during which the excess gum tissue is removed, and the remaining tissue is reshaped to expose more of your teeth. Gum contouring refers to a cosmetic dental procedure in which any excess gum tissue (that extends over the enamel of the teeth) is removed, either through surgery or a laser. The remaining tissue is then reshaped to help expose more of your teeth, helping prevent a gummy smile. Gum contouring is a minimally invasive procedure and involves the gentle yet precise reshaping of the gum line. Your gums will be sculpted by removing excess gum tissue to reposition the gum line so that more of your tooth is visible. The amount of gum tissue removed is just enough to enhance its contour around the teeth. Gum contouring provides a permanent solution to gummy smiles, so once you have undergone it, you won’t have to worry about excess gum tissue again. Dental lasers can also be used to help contour the gum line. In fact, lasers are a better option for this procedure as they can offer more precision and comfort for the patient. Evening out your gum line or removing excess gum tissue will not only help improve the aesthetics of your smile but it can also make removing plaque and tartar much easier which can help prevent a host of other dental problems from occurring. The good news for many is that you don’t have to live with a gummy smile. There are many different treatment options that you could opt for to keep smiling brightly and widely! Gum contouring can effectively help your smile to look less gummy and more natural. To learn more about how you can fix your gummy smile with gum contouring, book an appointment with Wahroonga Family Dental Centre by calling (02) 9489 2928 or sending us a message via our Contact Us page.